The Princess Bride is my favorite movie of all time. I grew up watching this movie over and over and over. I love it. I love everything about it. I love the characters, the soundtrack, the script, the plot, the cheesy-ness, the humor, the one-liners, the clothing…. I’m not saying you have to love this movie to be my friend……… but it helps. I used to be able to quote this movie from beginning to end verbatim. I haven’t watched it in a while, and that’s a skill that needs to be worked at to be retained. I’m still pretty good for quite a lot of quotes, though. I am seriously looking forward to introducing my children to this movie. (I’m waiting until they’re old enough to really appreciate it, though… so maybe in another year). I own the soundtrack, several versions of the DVD and Blu-Ray, the book… and I think I have a copy of the script saved somewhere on my computer. This is one of those few, rare (seriously rare) instances in which I cannot honestly tell you whether or not I like the book or the movie better. I love them both. I love them both equally. They are brilliant, inspired, hilarious… this is the sort of pairing that should exist between book and movie, and yet so often fails miserably. I could go on for hours. However, I did actually have a point for this post, and it wasn’t just to subject you to the ravings of an infatuated fan. I wanted to discuss the book for a bit. The whole “Princess Bride: Book or Movie” conversation has come up over on goodreads, and I wanted to take a minute to clarify a few things in more detail than I am able to over there. If you have read this book, or pick this book up off the shelf, you are in for an unparalleled treat. But there are a few things you ought to know first. 1. S. Morgenstern does not exist. Or rather, he does… S. Morgenstern is William Goldman’s pen name. I read the book many times before I realized this… and reading it in ignorance or reading it knowing the truth… I feel both can be very fun ways to read the book. 2. William Goldman does not have a son. He has 2 daughters. When he was tucking them in one night, he wanted to tell them a story. He asked them what it should be about. One said, “Princesses!” the other said, “Brides!” and he replied, “Well then, that will be the title.” His wife is not a psychiatrist, either. 3. Florin and Guilder are not real places. They are currencies. 4. The Princess Bride: The Good Parts Version is the ONLY version of this book that exists. There is no political satire that this story was based off of. All of the author asides and references to the book his father read him as a little boy are as made up and fictional as the rest of the story. Some people I have talked to have been bothered by the above facts. They feel that the author (William Goldman) is “lying” to them in his prologue about his father reading him the book, searching high and low for a copy of it to give to his own son, and his own quest to abridge the novel to make it into a child-friendly read. I have a few things to say to that. 1. What section of the library do you find this book in? The FICTION section. (Which should be plenty good enough and we could stop right there, but if you’re still bothered, keep reading). 2. Nobody complains about the bits of the movie where the Grandpa is reading to the grandson. Nobody complains that those scenes detract from the story. In fact, that flipping back and forth is what most people LOVE about the movie. Well, guess what? It is also part of the book. The idea was in the book first. 3. While we’re on the topic of complaints: nobody complains that Peter Falk isn’t really Fred Savage’s grandfather, either. Personally, I find the author asides to be immensely humorous. When I read the story the first several times, I knew none of the above facts… but I enjoyed the story anyway. When I learned that the asides were part of the story (I was in college before I discovered this)… I did not feel betrayed or lied to. In fact, I felt that I needed to tip my hat to the author’s brilliance. Though Morgenstern is the pen-name, Goldman himself became a bit of a fictional author to some extent as well, which is vastly entertaining. In essence, the fabrications about William Goldman’s life and the creation of the author S. Morgenstern aren’t really all that different from what was done in A Series of Unfortunate Events by the so-called Lemony Snicket… Goldman just did it first. Really, all of this just makes me love the story more. I love the author’s sense of humor… and I even love that not everyone “gets” it. We few, we happy few, who do “get” the joke… we are truly a band of brothers and sister… probably a band of nerds… but I choose to embrace the fact that I’m a nerd and make no apologies for it. 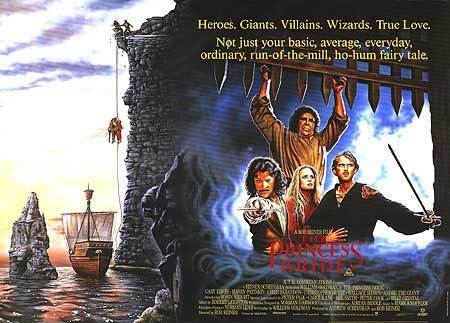 What is your favorite Princess Bride quote or scene? What other “campy” movies do you just love? I did not know that, at all. I’ve been convinced since picking the book up that there was a very fat, duller version of it sitting around somewhere and I was cheating for reading the shorter, fun version with all the dull bits cut out. I feel so much better about life now. Actually, that was brilliant of him! I think the idea is great and I admire him a good deal more now. Now I really envision him as Peter Falk, sitting at the side of his daughter’s bed, telling them a story, trying not to be interrupted. Oh dear, a favourite quote. I’ve too many. I love this movie and I need to finish the book someday. (Favourite scene, I really love the one with Max, but the whole movie is my favourite scene.) Quote, the ones which I quote the most are, “Let me explain, no, it will take too long. Let me sum up.” “Bye, bye, boys! Have fun storming the castle!” And, “Chocolate coating, it helps the pill go down better.” (Oh yes, and I LOVE, “He’s only MOSTLY dead, which is different from being all dead. If he was all dead there is only one thing to do.” “What’s that?” “Go through his pockets and look for loose change.” Now I should go before I quote the whole movie…. Yes, yes yes!!! I love all the quotes. All of them. Haha, envisioning Wm Goldman as Peter Falk telling his daughters a bedtime story!!! I love that! I shall probably now envision it that way every time I read the book from now on! Oh my goodness I LOVE Princess Bride…the movie and the book! I like the author asides for the most part, there was one long section that got boring to me though. I think it was the part where Goldman is reflecting on someone telling him that “Life is not fair. Anyone who says otherwise is selling something.” He spent pages just detailing this when it is summed up in one line just as well in the movie. Ah well. Other than that, it is one of my favorite books ever! My favorite quote from the book that is not in the movie is probably when Humperdinck says to that other princess, “Madam, feel free to flee.” I think that scene did an excellent job portraying Humperdinck’s character…and it was hilarious! Haha, thank you for this post! I twuly wuv Pwincess Bwide! I wuvs it too. Huggles it and then runs to pop it into the DVD player… because it is TIME to rewatch this one! Great post. Wow, I love this movie as well and I could at one time quote large portions of it myself. My favorite, though would simply have to be, “Hello, my name is Inigo Montoya. Prepare to die!” That is my favorite scene from the movie, though there are a hundred other quotes I love as well. As for the book “duping” people, oddly I never had that impression. I first read the book in college, several years after the movie came out and I took Golding’s references to another version of the book and the “autobiographical” sections as merely inventions of the author. I didn’t believe that Golding was trying to tell us about his actual life in the book. There was just something about the tone of it that didn’t make me take it very seriously. And though I really like the book and there are some wonderful gems and extra details in it that did not make it into the movie, I prefer the movie version hands down. The movie is slightly more serious and the actors are all universally charming, adding layers of nuance to the characters that simply weren’t there in the book where it seemed like everything was played for laughs. But my chief reason for preferring the movie would have to be the aforementioned “autobiographical” passages. The one scene where Golding is at the pool would be the one that bothered me the most. At some point, I really started disliking the fictional Golding. He seemed pompous and crass at times and I really just grew tired of hearing about him. Contrast that to the grandfather and grandson passages in the movie which were always welcome and delightful and you’ll see that therein lies the rub for me. Again, I did like the book, but it was the Wesley and Buttercup parts that made it so enjoyable. I think Golding could have cut out a large portion of the “real world” backstory and had a better novel. Yeah, I didn’t love the scene at the pool, either. However, it’s so over-the-top that it didn’t bother me as much as it might have (possibly because it’s colored in my memory as being read out loud by my dad (as I read the book the first time when I was in grade school), and hearing him nearly dying with laughter throughout the entire book). Favorite quote from the movie… too many, I cannot pick. I’m loving reading everyone else’s favorite quotes, though. I agree with ALL of them! I can count on one hand the number of campy movies that exist where every line is quotable. In addition to this one, my faves are Monty Python and the Holy Grail and The Emperor’s New Groove. Awww, I feel so loved! Thanks for putting up with me and my quotes for so long! Best movie ever!! For my part I don’t think it could have been made without the Grandfather bits. And the author probably couldn’t care less if people “felt like they were being lied to”. Quotes…the whole movie!! “Word goes round’ that you’ve gone soft and then it’s work, work ,work all the time”. Seriously, a better movie hasn’t been made (LOTR gave it a good run for its money). I have a sneaking suspicion that Goldman made up S. Morgenstern to weed out his “true” fans. Thanks for stopping by!